This is my daughters school dress which had the hem pulled down at the end of Term 1. It has sat in the bottom of the ironing basket for the whole two winter terms waiting to be fixed. When the hem pulled on the 1st dress, I used hemming tape but hand stitching really does give it a much nicer finish. Now that we are 2 weeks into Term 4, the winter kilt has been packed away and I can longer keep washing her only other dress each night. This job can no longer be put off. 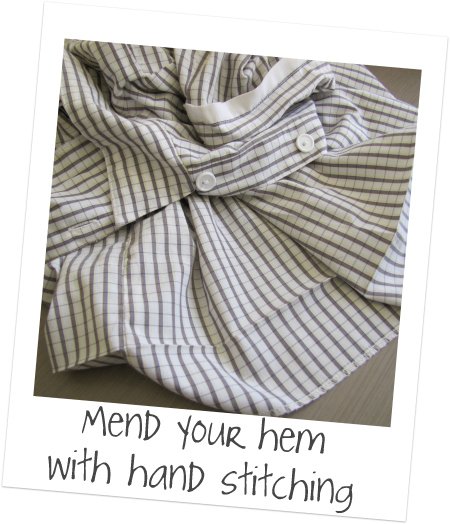 Press your hem to it's original fold. Take a very long piece of thread, double over and tie a secure knot in the end.Match thread to your fabric as close as you can. Start at a side seam. Only hem half the way around with the same thread. 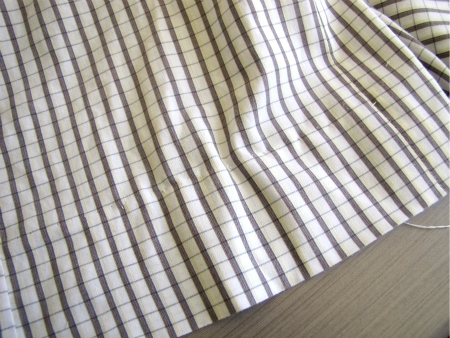 If the hem happens to break again, then you only need to hem that section again and not the whole lot. 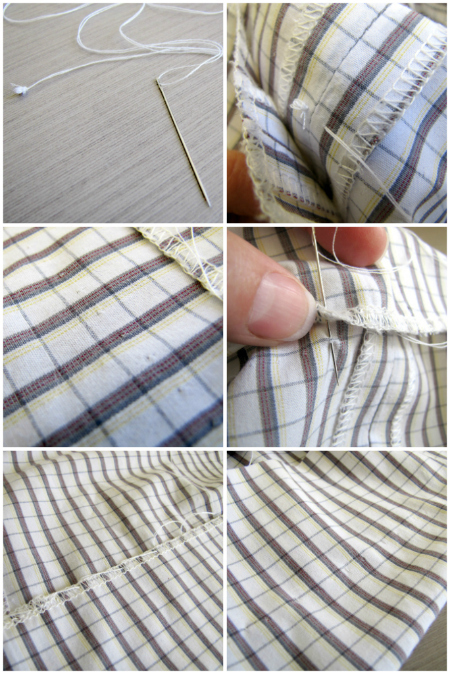 Try to use the stitching holes from the original hem. It will keep your stitching straight and evenly spaced. Place your needle through the folded hem and take just the smallest amount possible of the front fabric - that's why it's great to use existing stitching holes. Pull your thread through and continue - the original thread holes were quite close together, you don't need to stitch that often, about 1.5 - 2cm apart. As the last image shows, the thread is barely visible from the front. Press, then go to the pantry and give yourself a big piece of chocolate for finally getting that hand sewing done! This is what will happen if you pull too tightly on your thread as you sew - it will gather. Be careful of this and keep checking as you sew. definitely should have used that tip about tieing off at the side stitching though. i'm having nightmares about it breaking!! I hope you reward yourself with a BIG piece of chocolate! I'm shocking at repairs and have a pile of three-four things that need fixing, including a shirt that has been in there for nearly two years....I do feel slightly guilty so after your lovely tutorial, I might just make myself do a little fixing! Oh I'm so glad I'm not the only one who avoids mending! Those 'jobs' don't allow for much creativity do they? Tedious but necessary all the same! I'm glad I taught one son how to do this!